German Expressionism, one of the most significant movements of early European modernism, was an enormously powerful element in Germany's cultural life from the end of the Wilhelmine Empire to the Third Reich. While the movement embraced such diverse artists as E. L. Kirchner, Wassily Kandinsky, Käthe Kollwitz, and George Grosz, all the participants shared an almost messianic belief in the power of art to change society. 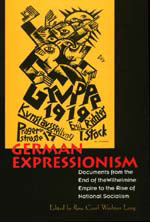 Rose-Carol Washton Long has drawn together over eighty documents crucial to the understanding of German Expressionism, many of them translated for the first time into English. Rose-Carol Washton Long is Professor of Art History at the Graduate Center of the City University of New York. Among her books is Kandinsky: The Development of an Abstract Style.